As one of Westchester County’s finest Rehabilitation and Nursing Centers, The Paramount at Somers Rehabilitation and Nursing Center has earned an outstanding reputation for its compassionate and high caliber subacute and long term care. We are an integral part of the community and take pride in our warm, home-like setting, and dedicated, compassionate staff. We are enhancing our accommodations and implementing innovative rehabilitation programs that optimize the short term rehabilitation needs of the community. We aim to provide a total, immersive rehabilitation experience that renews and reinvigorates the body and soul. 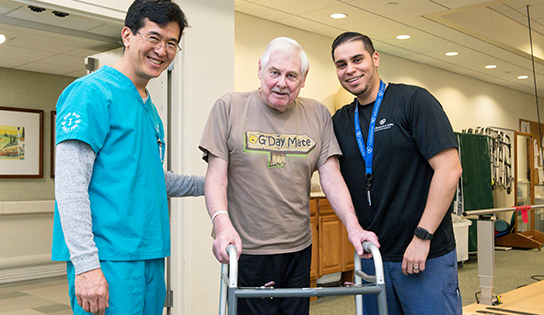 Our stellar rehabilitation program significantly enriches the health and well-being of our patients by delivering specialized therapies to get our patients rapidly back on their feet. With progressive rehabilitation delivered daily by our expert rehabilitation professionals, every individual sees demonstrable results in a quick time frame. Family members are always included in the process, and can monitor the progress of their loved ones in real-time. With a spacious Rehabilitation gym, elegant dining, beautiful private and semi-private suites and an array of comfort-enhancing services and amenities, patients can enjoy high caliber, proactive care in our warm and optimistic setting. We know you just want to get back out there. Our personalized approach and comprehensive treatments will ensure that you’re back on your own two feet as swiftly as possible.